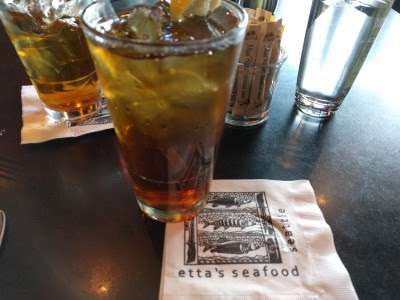 Etta's was the second Tom Douglas restaurant at which we dined in Seattle. It's in Pike Place Market - or at least right next to it/on the edge of it on Western Ave. We made reservations and were seated with a view out the window toward the park & water. By this point in vacation, my cold had exploded into drippy nose and sinus crap. I didn't want alcohol, I just wanted tea. SP avoids alcohol in the middle days of the week because of a medication he takes, so we both ordered iced teas. Very good iced teas. I was looking at the receipt and it said hot tea, and for some reason I am remembering they don't normally served iced tea but they made hot tea for us and then iced it. If I am correctly remembering, I give them extra points. 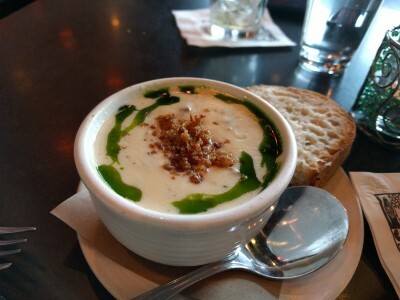 SP ordered Creamy Clam Chowder (with bacon, parsley oil). I tried a bite and agreed that it was very tasty. I don't remember much else about it other than cream, clam, bacon, yum. 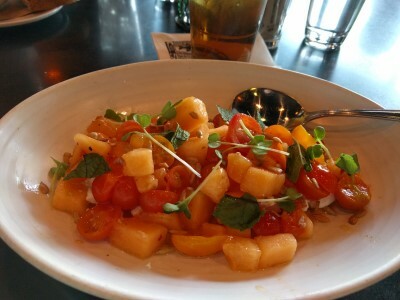 I do remember this starter I ordered: Housemade Ricotta (marinated prosser melon,tomato, mint). I remember it because it was large, the ricotta was sooooo tasty, and the melon & tomatoes went together better than I expected. SP helped me finish it and he agreed that it was an excellent starter. 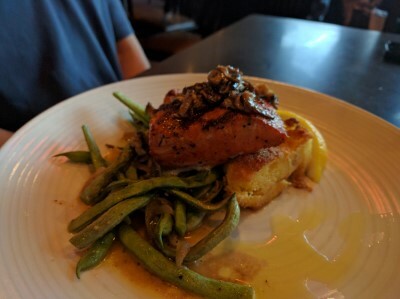 For his entree, SP ordered Etta's "Rub with Love" Salmon, small portion (grilled coho salmon*, sauteed green beans, cornbread pudding, shiitake relish). He said the salmon was cooked nicely and the cornbread pudding good - his usual comment, that it was tasty. 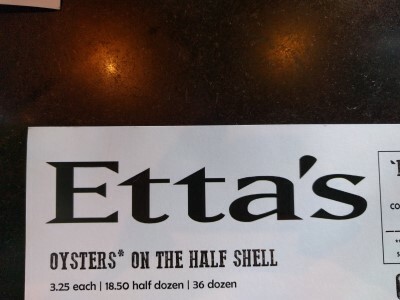 Etta's offers a lot of fish, which is not my thing. 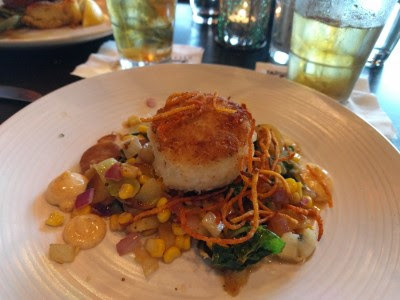 I didn't want fried shrimp so I chose Crab Cake (dungeness crab cake, sweet corn-potato hash, local greens, old bay aioli). Dungeness crab makes for a different crab cake than usual. The crab is much finer. It was a very good crab cake, just different. I also wasn't feeling well and was full from my starter, so I kind of forced my meal down. I remember the crispy straws and enjoying the hash. 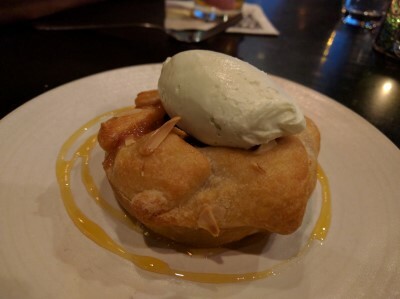 I was too full for dessert, but SP ordered a Plum & Almond Crostada (buttermilk ice cream, anise hyssop, zaya rum). I don't remember this at all. I was too full, I had a tiny bite that was mostly crust, and that's it. SP liked it a lot, this being his preferred kind of dessert (fruit desserts). Overall, we really enjoyed Etta's. 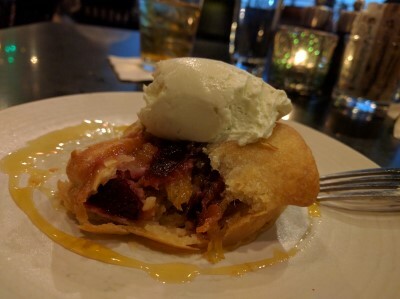 SF had suggested it to us when we dined at Red Cedar & Sage. Our server was fantastic and the food tasty. We'd go back.